Wedding DJ – Swing or Nothing! Enjoy a unique, hip and classy wedding celebration with music and entertainment by Nathan Dias! During cocktail and dinner hours, relax to the elegant and romantic sounds of jazz greats like Nat Cole, Billie Holiday, Frank Sinatra, Ella Fitzgerald, Louis Armstrong, Ray Charles, Duke Ellington and Artie Shaw. Later on, your dance party kicks off with a high-energy mix of rockin’ and boppin’ swing, soul, R&B and party music that will get dancers of all ages moving and grooving! 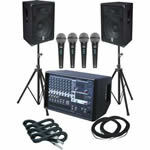 Nathan’s sound system consists of a Yamaha EMX-512sc amplified mixer and BR-15 speakers with 400w of sound output per channel, powerful enough to fill medium to large-size spaces. Request a Wedding DJ Quote online and get a response within one business day! Look and feel comfortable dancing your first dance as a couple! 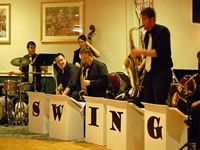 Learn the basics of swing dancing and a unique choreography customized for you that will wow your guests. Most couples can learn to dance comfortably with as few as five 1-hour lessons. Get your guests out on the dance floor too! Nathan and dance partner will teach a fun and easy dance lesson so that everyone can join in the fun! 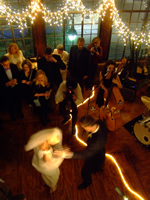 Request a customized Wedding Entertainment Quote!